Are the USB drivers supported in Windows 10? Windows 10 only allows the installation of signed drivers, however, the USB1/USB interface board drivers available on the website are unsigned. When attempting to install these drivers, you may see the following error message (or something similar): "Windows found driver software for your device but encountered an error while attempting to install it. The hash for the file is not present in the specified catalog file. The file is likely corrupt or the victim of tampering." USB2 drivers will install properly in Windows 10 systems. Please note that because of differences in hardware, Windows PC USB drivers will not work on Windows RT. Why doesn’t the USB driver I downloaded work with other ANT USB devices? The ANT USB driver downloaded from the ANT website may not be compatible with end user products, including Garmin devices and software. The drivers available on the ANT website should only be used with the ANT development kit and development software. Please contact the manufacturer of your device to get the correct driver for your device. How do I properly re-install ANT USB drivers on my computer? The ANTUSB-m and ANTUSB2 Stick drivers can be uninstalled via Windows’ Device Manager, then reinstalled by simply re-inserting the USB device and allowing windows update to download the drivers. Alternatively, the drivers could be downloaded from the website here and installed manually. Re-installing the ANTUSB1 drivers is not always a trivial procedure. To do this properly, the old ANTUSB1 driver must first be completely removed from the system. Unfortunately, this is not as easy as uninstalling the driver via Device Manager. 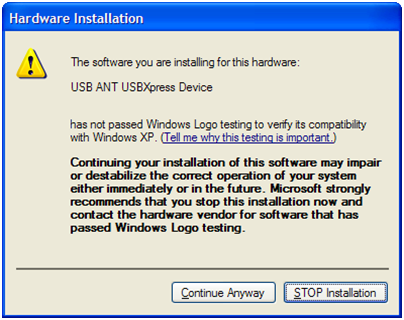 To completely remove the ANTUSB1 driver in Windows XP, please follow the technical note “Uninstalling USB1 Drivers” . Once the old drivers are completely removed, the new drivers may be installed using the standard procedure. Can I re-distribute your USB drivers with my commercial application? Yes. However, if you are doing a custom USB stick with a different PID/VID, this requires you to create your own customized driver and ANT library. For more information please contact usk directly. What are the PID and VID of the black ANT USB sticks, and of the development kit USB stick? Please note that the PID may change as these products are upgraded over time. Are WHQL signed drivers available? There are two sets of drivers for the ANTUSB1 Stick – an unsigned version on the website, and a signed version available by contacting us. The unsigned version is meant for the interface board that comes with the development kit, but will also work with the ANTUSB1 Stick. If you are distributing a product, the signed version is recommended. There are no unsigned versions of the ANTUSB-m and ANTUSB2 drivers. For more information please contact us directly. Are the drivers for ANTUSB1, ANTUSB2 and ANTUSB-m different? Yes, because they are using different hardware. The ANTUSB1 uses an SiLabs based driver and the ANTUSB-m and ANTUSB2 uses a LibUsb-Win32 based driver. How do I differentiate ANTUSB1 and ANTUSB2 stick I have? The version of the USB stick is printed on the back of the plastic case. Otherwise the version can be determined by using the Device Manager. Access the windows device manager by navigating to Control Panel > System > Device Manager. In the manager, ANTUSB2 sticks are called “ANT USB Stick 2”, under the “libusb-win32 devices” node. ANTUSB1 sticks are either called “ANT USB Device” or “ANT USB Stick”, under the “Universal Serial Bus Controllers” node. I get a warning message from windows when I install the USB drivers. Why is that? Windows will issue this warning when trying to install a driver that’s not WHQL signed. The USB1 drivers on the website are not signed. If using these drivers, ignore this warning by pressing the “Continue Anyway” button. This could be an indication that there may be another version of the LibUSB drivers already on your computer. To make sure that the proper drivers are installed, download the USB drivers from the website to a known location on your computer. When you re-connect your USB Stick and are prompted to install drivers chose to install them manually from the location you have saved them to. Are ANT drivers available for Mac OS? Linux? Drivers are not needed in the Mac OSX environment., the USB sticks should be recognized with no additional effort. Mac libraries are available in the Downloads area of the website. A Linux SDK for ANTUSB2 and ANTUSB-m sticks is currently in Beta. Please refer to this forum post for more details. Linux drivers are not currently being planned for the ANTUSB1 stick or ANT-UIF interface board (based on the CP2102 USB to UART chipset). It may be possible to design your own Linux drivers for these devices by utilizing the Virtual Comport drivers from SiLabs. Please visit the SiLabs website for more details.